I am very happy I added this chair...it makes the set look complete and is great additional seating to the living room when needed. "Revel in the whispered opulence of the Arise Dining Armchair. 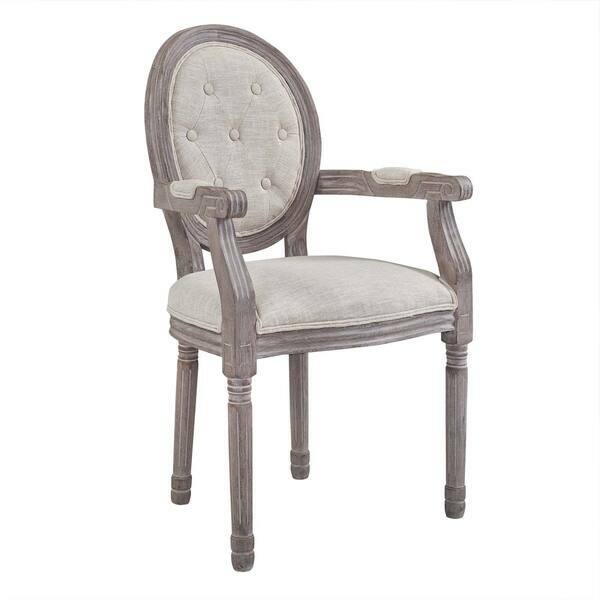 Featuring a fluted wood frame, button tufted diamond trim, elegant welting, dense foam padding, an upholstered fabric seat, and scooped armrests, this oval back dining or accent chair elegantly blends old world charm with modern intrigue. Designed with a weathered vintage French look and an undeniable appeal, Arise supports up to 331 pounds and comes with foot pads to preserve flooring. Comes fully assembled. This product will be shipped using inside home delivery . The product will be delivered to your door or the nearest ground-level entrance of your residence. Signature required upon delivery. Dimensions 22.0 In. X 22.0 In. X 37.5 In. This chair was purchased to be used as guest chairs in the living room. They are small in scale, my 5'3" self and my 5'9" husband sit comfortably in them. The wood is rough, not smooth, nearly a rustic finish with a gray-ish wash. They are easily carried from one room to another. The fabric is linen-like and the gray color has a hint of taupe. We bought 2 chairs and they fit our needs nicely. Pretty but smaller than a standard chair. "How much does the chair weigh?" Per my husband and the bathroom scale, it weighs 14 lbs.